Democrat Jacqui Irwin currently represents Assembly District 44 and will not be termed out until 2026. Irwin is expected to win re-election in 2016; however, a well funded and well known Republican could compete for this seat due to a close split in voter registration. 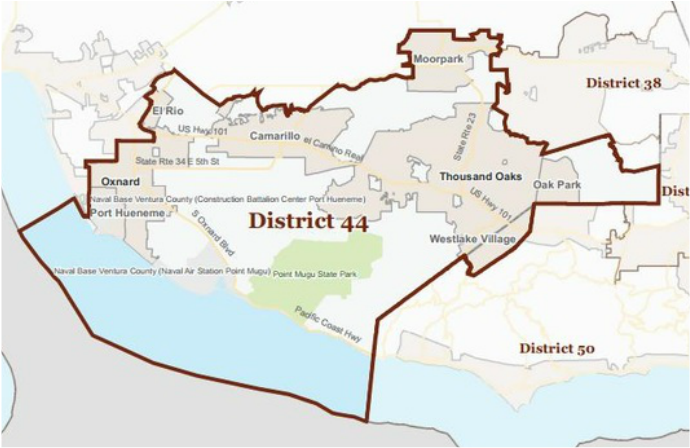 Jacqui Irwin was elected in November 2014 to represent California’s 44th Assembly District, which includes the communities of Camarillo, Casa Conejo, Channel Islands Beach, El Rio, Lake Sherwood, Moorpark, Oak Park, Oxnard, Port Hueneme, Santa Rosa Valley, Thousand Oaks, and Westlake Village. The top vote getter in two of her most recent elections for Thousand Oaks City Council, Jacqui Irwin has a history of working across party lines to help make her community one of the safest places to live and raise a family. First elected to the City Council in 2004, Irwin served two terms as mayor of Thousand Oaks, where she was a strong advocate for the preservation of open space and responsible development. As a councilmember, Irwin actively served on several boards and committees, including the Thousand Oaks Crime Prevention Task Force; Lynn/Olsen Road Traffic and Pedestrian Committee; Conejo Coalition for Youth and Families; Intergovernmental Relations Committee; Finance and Audit Committee and Capital Facilities Committee. Irwin plans to focus on these same issues while serving in the Assembly—especially working to ensure that all California families have the opportunities to thrive in safe communities. Irwin also serves on the executive board for the Ventura County Chapter American Red Cross, the executive board for Community House of Hope, the advisory board for Women’s Economic Ventures, the CSUCI Arts and Sciences Leadership Council, and has volunteered with the Girl Scouts of the Central Coast. In addition to chairing the American Diabetes Tour for the Cure for three years, Irwin was co-chair of the American Cancer Society’s Bugatti Ball. Additionally, she is a member of the Thousand Oaks Rotary Club. Her awards include having been recognized as the Woman of the Year for the Greater Conejo Valley Chamber of Commerce, and in 2011, the Girl Scouts of the Central Coast presented her with the Girl Scouts Woman of Distinction Award. In 2012, she was recognized by the California Legislator’s Women’s Caucus as Women of the Year for the 37th Assembly District. While earning a Bachelor of Science in Systems Engineering from UC San Diego, Irwin was an All-American in swimming and attended national championships all four years. A proud mother of three young adults, Jacqui Irwin and her husband Jon, who serves as Head of Global Business Development for Amazon Instant Video, have lived in Thousand Oaks for nearly 20 years.